Liverpool boss Jurgen Klopp has brought massive transformation to the Merseyside club since moving to England. This season, Liverpool look to have assembled one of the best teams after a long time. This has been brought about by the addition of quality players in the transfer market. One area that has significantly improved this season is depth and quality in midfield. The addition of Naby Keita, Fabio Tavares and Xherdan Shaqiri have increased quality and depth in the midfield which can account for easy rotation of the squad. Liverpool failed to sign a replacement for Phillipe Coutinho in the summer transfer window and and it seems that Klopp has found other ways of bringing creativity to the side rather than signing a creative midfielder. While it has been evident so far this season that the Liverpool midfield has at times lacked the creative spark, it is also worth noting that Klopp has used other formations and approaches to try and bring both the balance and unpredictability to the side. I look at the ways Klopp has used to get the best out of the players so far this season especially the midfield. 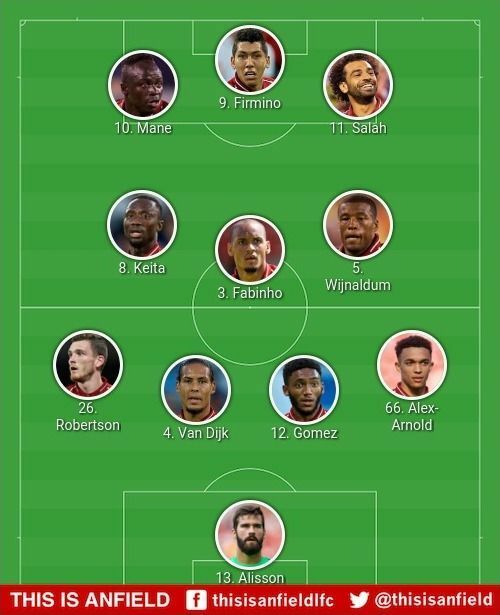 Line up selector courtesy of This is Anfield. Jurgen Klopp has brought back the 4-2-3-1 formation despite succeeding with the 4-3-3 formation the whole of last season. The 4-2-3-1 has brought the unpredictability in attack together with the midfield fluidity and might be the perfect formation when dealing with low defensive blocks. One main thing with this formation is the double pivot midfield shape. A Fabinho-Keita double pivot is what many Liverpool fans are looking forward to as it has the potential to get the best out of the two new signings. Both Fabinho and Naby Keita excelled in the double pivot midfield role with their teams before joining Liverpool and therefore their adaptability to the team might be eased a little. A double pivot midfield consisting of Fabinho and Gini Wijnaldum or the former with Naby Keita might be the way forward for Liverpool when using this formation. Either Fabinho or Henderson are utilised as the defensive midfielders in the double pivot while Wijnaldum and Keita are the box-to-box midfielders who are required to make deep attacking runs and progress the ball to attacking players. The three attacking players are given enough space to execute their play-making skills while having enough cover behind them. Taking the game against Red Star as an example, Liverpool’s attacking midfield trio consisted of Firmino as the central creative midfielder with both Shaqiri and Mane occupying wide positions while Mo Salah was the lone striker. In possession, the two fullbacks drifted high up the pitch to provide attacking width and occupy the opposition’s fullbacks while both Shaqiri and Mane dropped deep to form a four-man midfield alongside Fabinho and Wijnaldum. This resulted in a 2-4-4 attacking shape when Liverpool had the ball as shown in the screenshot below. This was also the case when Liverpool faced Cardiff city in the premier league. The 4-2-3-1 formation provides the flexibility and unpredictability when attacking although it has the risk of exposing the defensive line when the team is caught on the counter as there is a minimal cover to the fullbacks when they push to occupy the space up the pitch. The 4-2-3-1 formation is, therefore, more useful when dealing with teams that defend with low defensive blocks as there is much creativity offered by the creative players. Klopp has used this approach to counteract Liverpool’s problem of not creating a lot of chances when playing with defensive teams. This is Jurgen Klopp’s most favoured formation at Liverpool and involves a flat midfield trio who can also form a tight triangle when in possession behind a front 3. Liverpool’s front 3 are all rounded attacking players and the availability of Roberto Firmino as the centre-forward affords Mane and Salah the space to run in behind the defense. Firmino being the ‘false 9’ usually drops deep dragging defenders away leaving spaces for Mane and Salah to exploit. This formation is ideal for Liverpool when dealing with high pressing and possession-based sides as it provides the flexibility to execute a collective high press without leaving spaces in between. The midfield trio is also a complete unit and consists of a destroyer, a box to box midfielder and a creator who is also good in initiating the high press. A trio consisting of Fabinho, Henderson or even Gini Wijnaldum as the number 6 has already been of use this season with Keita, Shaqiri and Lallana given other roles. 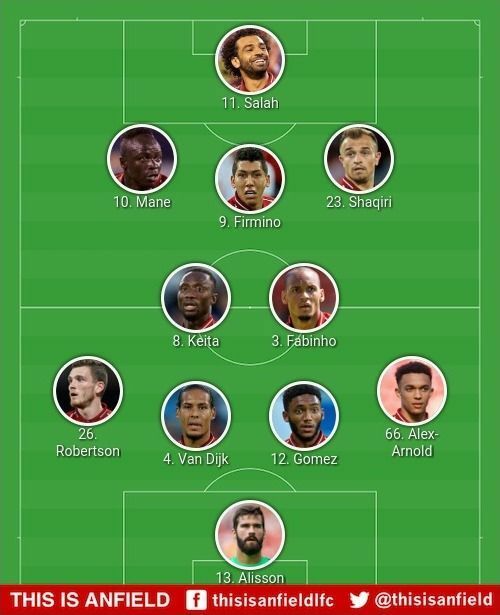 In my opinion, the strongest midfield trio will consist of either Fabinho, Gini or Henderson as the holding midfielder, Keita as the box to box midfielder and either Shaqiri or Chamberlain (when fit) as the creative midfielders. Liverpool can also use Wijnaldum, Oxlade Chamberlain and James Milner in the box to box role in the absence of Naby Keita.